Celebrating 27 years of nourishing food, kindness, and service with dignity! Review our 2020 Strategic Plan: A Path to Food Security! 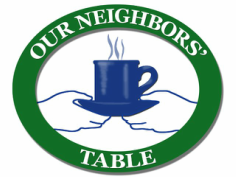 Our Neighbors' Table was established in 1992 through the Amesbury Council of Churches. The Wednesday Meal currently offered at Our Neighbors’ Table was the first program opened to the community. 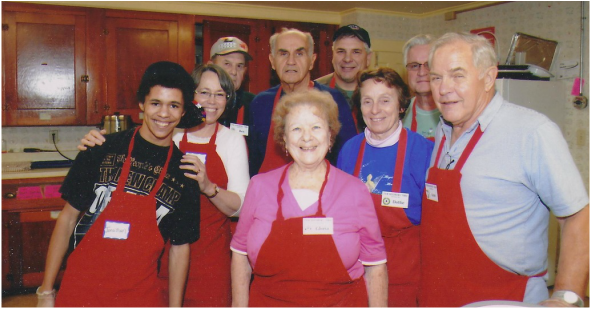 The first meal - spaghetti and meatballs prepared and served by volunteers in May 1992 - hosted 8 guests at the Main Street Congregational Church in Amesbury. A table at the back of the dining room held a small assortment of canned goods available for guests to take home if needed. We welcome 150 guests to our Wednesday Meal each week. Our grocery programs provide groceries, fresh foods, and toiletries to more than 500 households from 12 cities and towns a week across 4 market locations, and deliver groceries and hot meals to home-bound individuals in 3 towns. Each holiday season, we distribute special groceries and turkeys to more than 700 families. But most of all, food is never more than a phone call away through our 24/7 emergency hotline. While we all envision a day when all of our neighbors have enough food and our services are no longer needed, the leadership of Our Neighbors’ Table is committed to ensuring that our doors are open as long as someone is in need. Take a look at our current Vision Statement that guides our work. Our 2020 Strategic Plan will create the roadmap to ensure we can continue to meet the need in our region and work toward our vision of real food access when and where it's needed. Our Neighbors’ Table is governed by a volunteer Board of Directors, comprised of people living and working in the communities we serve. Many began as volunteers at the food pantry or Wednesday Meal, and continue to serve in our programs today. As the leaders of our organization, they share a common interest in serving the needs of our community and ensuring that Our Neighbors’ Table is a welcoming place for all. We are always seeking new members for our Board and its working committees. If you would like to be involved, contact us today! Hunger comes in many forms. Our Neighbors’ Table is committed to establishing a community that provides for the whole person with nourishing food, kindness and dignity. Our Neighbors’ Table values its partnerships with local service providers to meet the needs of local residents. Beginning in 2009, Our Neighbors’ Table began organizing providers serving residents of Amesbury, who now meet monthly in our Community Service Providers meeting to share information and ideas to better meet the community’s needs. If your agency is interested in joining the Community Service Providers’ meeting, please contact Lyndsey Haight at Lyndsey@ourneighborstable.org. As a part of our work here at Our Neighbors' Table, we are also involved with several collaborative projects, including the Newburyport Community Collaborative, the North Shore Hunger Network, and the Greater Boston Food Bank Advisory Council.